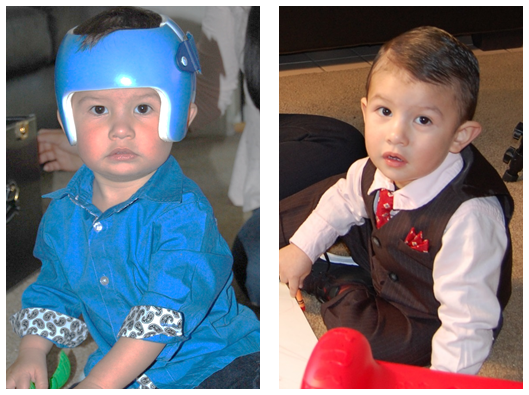 “The reason I love ChildStrive is because they are there for us,” says Jhonny’s mom, Irene. “They are my angels.” She was worried about her son because at ten months he wouldn’t tolerate being on his tummy, he didn’t crawl, refused to transition from baby food to table food, and made little eye contact. Irene relayed her fears to a nurse at the WIC office and was referred to ChildStrive. After an in-home assessment, Jhonny was diagnosed as developmentally delayed and services began with a physical therapist in their home. Because Jhonny wasn’t willing to spend time on his tummy he had developed a flat spot on the back of his head. His pediatrician prescribed a foam helmet to help his head form into a more natural shape. Irene said it was difficult to act like a “normal family” since she felt people would look at them funny and without family in the area they felt alone and isolated. With help from ChildStrive’s physical therapists, speech therapist and educator, Jhonny has overcome many obstacles. Today Jhonny is a smart 2-year old, learning words and numbers in both English and Spanish, plays independently, and loves anything with music. Their family continues to work on more complex playing, advancing his communication skills, and socializing with other children. Irene and Juan credit Jhonny’s incredible progress to the services provided by ChildStrive.